It’s black and orange time of year again! Halloween is near!!! The shops are filling with all the merchandise relevant to Halloween like witches, broomsticks, black cats, spiders, pumpkins and fake blood and gore! Moms and Dads are for sure are already imaging what Halloween costume their kids will wear. 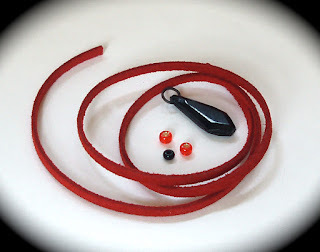 When it comes to fashion jewelry, with a few wireworking tools and basic skills, here’s a wire jewelry making project that can be used a pendant on a necklace, on a cord or chain. You can also use it for decoration. 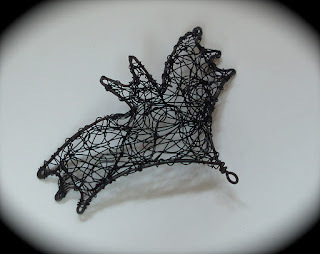 Now, let’s go into the bat cave 🙂 and start learning how to create the Bat Pendant by Linda Jones of Wireworkers Guild. 1. 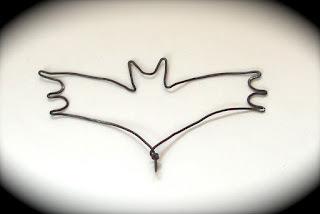 To make a pendant, cut about 12″ of 0.8MM wire and starting at the centre of the length, create the bat shape frame. 2. Secure one end around the other by wrapping (and cut off any excess) and then, using your round nosed pliers, create a link with the projecting wire at the base. 3. 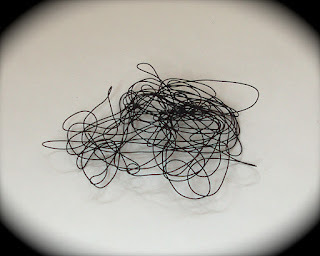 Working from a spool of 0.3mm black wire, cut off about 2.5-3 metres of wire and scrunch it up in your hands! 4. Stretch and flatten the scrunched wire out until it sits at the centre of your bat frame. Cut an arm’s length of 0.3mm wire and use this to ‘stitch’ and sew the scrunched wire into the frame, securing it to the sides. 5. If you feel there are any gaps within the frame, just add more wire as required. Once the frame is filled with the scribbled wire, gently ‘stroke’ it on a steel block with the steel head of your hammer and this will flatten and compress it all together. Then place it over a rounded object, such as a jar or bottle to dome it slightly. 6. 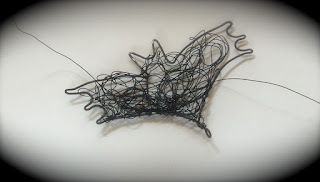 Using a workable length of 0.3mm black wire, attach the eye and nose beads by ‘sewing’ them into place within the scrunched wire frame. 7. 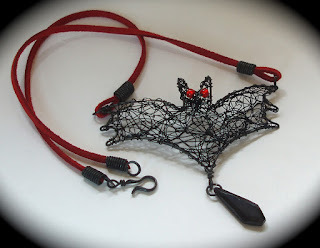 Now all that’s left, is to connect the drop bead with a jump ring from the end link of your frame, and attach the cord to each side of the bat wings. 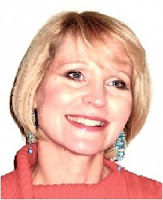 Linda is a UK based jewellery designer, specializing in wire and bead designs. 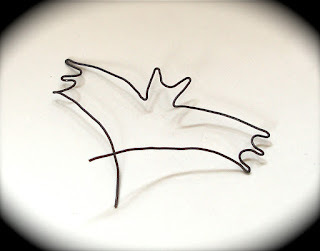 She initially began creating metal pieces, 20 years ago, but set up creative Wirework Workshops ten years ago for all skill levels. She also designs and creates one-off pieces on commission, specializing in bespoke wedding jewellery. She is also a regular project contributor to U.K. and U.S. magazines and with the rise of popularity in Wire Art and Wire-Wrapped Jewellery. 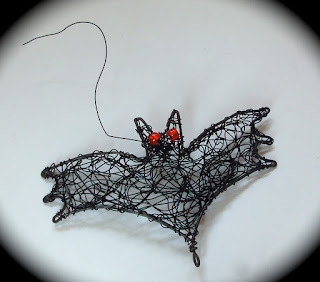 Linda also runs ‘The WireWorkers Guild’, which is an on-line free membership forum for anyone wishing to learn this fun craft; to share ideas and techniques. Access more jewelry making tutorials for only $2.32 a month!! !